Letting go of your feline companion is never easy. Your cat will probably die before you do, and you may even have to make the decision to help him or her to die. Death is a difficult subject for many people, but avoiding the topic isn't helpful to you or your cat. Cats, particularly indoor cats, are now living longer than they have in past years. There are also so many advances in veterinary care that many cats develop chronic health problems that can be handled with treatments at home, such as administering fluids under the skin. Doing different treatments at home may seem difficult at first, but the staff at your veterinarian's office can usually instruct you so that you feel more comfortable with it. Treatments for some diseases, such as radiation or chemotherapy, can't be done at home, are expensive, and have greater risks and side effects. Once an illness strikes, we tend to go into crisis mode and our thinking isn't as clear as it is when we're not stressed, so planning ahead is crucial. One way people have found useful in making these decisions is to ask, "If this was ME in my cat's situation, how much treatment would I want?" You may find that you have different boundaries for each of your animals. It's important to choose a veterinarian that you trust and have a good relationship with. People who do, often find it helpful to listen to the pros and cons that their veterinarian gives them. Most veterinarians will be very honest with clients about this. Veterinarians don't make as much money as you might think when you look at their bills, and they have bills of their own that they have to pay, both business and personal, so very few are able to treat your animal inexpensively or for free. There's only so much treatment you'll be able to afford for your animal before it becomes too much to handle. 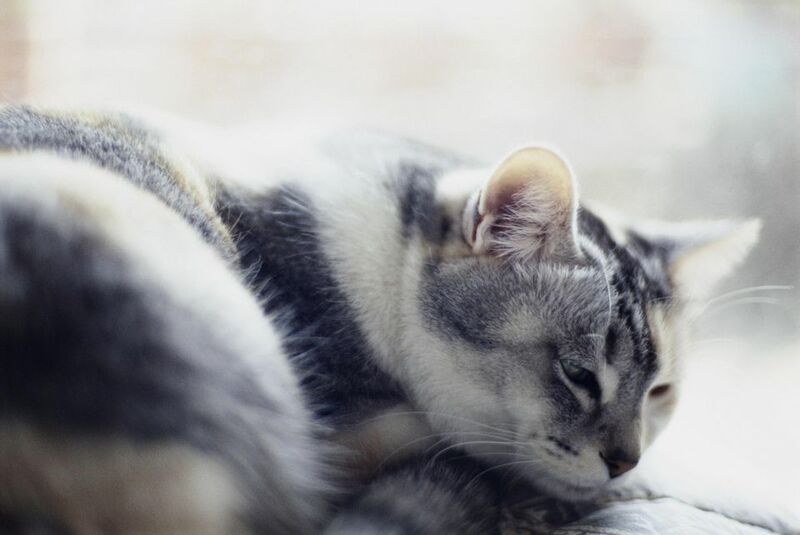 If you know that your cat is suffering and has no chance of returning to even an adequate level of quality of life, it's time to talk with your veterinarian about euthanasia. If a treatment would result in a less than a 50 percent chance of returning to a good quality of life, you should talk with your veterinarian about whether the treatment is really in the cat's best interest. Once a reasonable level of quality of life is gone, the loving thing to do is to let your animal go. Your veterinarian will give your cat a shot to calm him or her and then take your cat to the treatment area to insert an IV. Your cat will then be returned to you and when you're ready, your veterinarian will give an injection that will stop the heartbeat and breathing and your cat will peacefully slip away. Afterward, your veterinarian will ask you if you'd like to spend some time with the body. Many people are confused or even upset that the eyes don't close or if there are some last movements after death; this is normal. Some people choose to have a veterinarian come to their house so that their cat can die in familiar surroundings. Another issue that you should think about long before the time comes is what you'll want to do with your cat's body. If you want to bury it on your property, you must check the laws in your area, as this is illegal in many places. Some cities have pet cemeteries and you can get information on cost and services offered so that you can make a decision about this. Some people prefer to have the body cremated and returned to them. Many companies sell beautiful urns that are made specifically to store pet ashes. Some may make a donation to an animal charity in their cat's name so that an animal who is still on the earth can benefit. There are also "virtual cemeteries" on the web, such as www.rainbowsbridge.com that some people find comforting. Once your cat is dead and you have dealt with the body, it's important to take care of yourself. If your friends don't understand the relationship you had, you may want to find a chat line where you can communicate with people who understand. The Rainbows Bridge site has one and you can find others on the internet. You may want to make a "Memory Book" and put pictures, poems, prayers, cards, and other mementos in it so that you will always have it to remember this time. There are no rules for making one except that it should have meaning for you. Putting a Memory Book together can be very healing. Some people may choose instead to get an inspirational candle that is sold for this purpose and have a special prayer or "good-bye" service. Any ritual that helps you is a good one. There are also many books about dealing with pet grief that you can read and get comfort and ideas from. No one wants to say goodbye to a furry loved one, but there is great peace in knowing that when the time came, you were able to do the most loving thing. What Should You Do With Your Cat's Remains? How Old Is Your Cat in Human Years? Why Is My Cat Always Hungry?